Fractal Zoomer is a unique fractal viewer with intuitive user interface that allows users to view and generate more than 100 fractal types. This is extremely useful tool for generating and viewing different types of fractals. It feature more than 100 fractal functions that user can pick, including famous ones like Mandelbrot, Julia sets, maps and more. This piece of software comes with useful options such as zoom and the ability to customize the fractal appearance by picking colors, applying image filters or doing plane transformations. Fractal Zoomer is a really advanced and useful fractal viewer and some of the basic features are its database with over 100 fractal functions, the ability to perform plane transformations, the ability to change and customize color options, applying of image filters, the availability of Julia sets and Julia maps, the support for orbit tracking, available 3D heightmap. 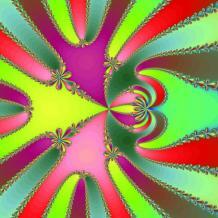 Fractal Zoomer uses boundary tracing algorithm to perform quicker calculations. It has support for entering user formulas. With Fractal Zoomer you will be able to render almost all of known fractal functions. A lot of features and options mentioned are there to further improve your fractal experience. With intuitive user interface and the ability to be used as portable app as it does not require to be installed, Fractal Zoomer is truly one of the best Fractal viewers available out there.